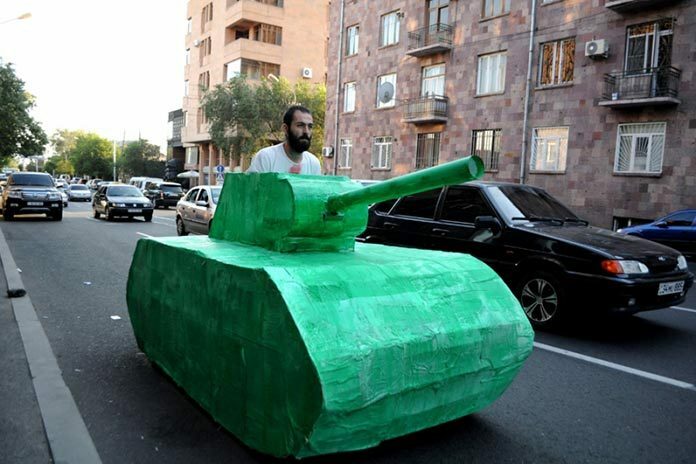 An Armenian civil activist who recently drove a cardboard tank through Yerevan streets in a “street art” protest and hit the metal gates of the National Security Service (NSS) building with it is facing a month in prison for his act qualified as hooliganism. Artak Gevorgyan, a member of the local Anti-Strike pressure group known for its campaigns in support of a number of imprisoned political figures and activists, staged his “artistic” action last summer in protest against injustices in Armenia. He says he had originally planned to drive his “tank” all the way from the Constitutional Court building to the buildings of the Central Electoral Commission and the Police, but later decided to end it at the nearby building of an agency that is a successor to the Soviet Union’s feared KGB. There he hit his green cardboard “armor” against the NSS gates. “If this case reaches the court, will these security officials be prosecuted [for criminal negligence] as well?” says the activist, reminding that his “dangerous tank” was at around the NSS for about an hour before and after the incident and no one took any measures against it. Gevorgyan’s lawyer Tigran Safaryan thinks that this way the authorities want to warn his client and other activists that besides administrative proceedings they may also face criminal prosecution for such a kind of behavior. “After that people will think twice before they take similar steps,” he said, as quoted by RFE/RL’s Armenian Service. The Anti-Strike group has for several years been involved in protests by means of street art, in particular, painting images and graffiti with political and civil messages on walls, in particular, in support of such imprisoned political activists as Jirair Sefilian and Shant Harutyunyan. Gevorgyan has also faced prosecutions before for his participation in different protest actions. In one case charges against him were dropped, on one other case his lawyer has filed an appeal with the European Court of Human Rights.